This article shows you how to effortlessly calculate your Body Mass Index (BMI). This is a kind of tool that compares your height and weight, and so gives you an indication of whether you are underweight, healthy or overweight. 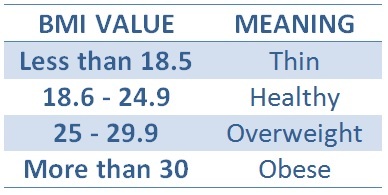 a) Take your weight (in kilograms, kg), we'll call this W.
b) Take your height (in meters, m), we'll call this H.
d) This is the table that you have to look at to find out about your health. Locate the value that you just found and see its meaning. A healthy value goes from 18.6 to 24.7. Less than that means that you're thin, and more than that range means that you're overweight. BMI = 90/1.772 = 28.73 and that means that you are overweight! a) Take your weight (in pounds, lb). We'll call this W.
b) Take your height (in inches, and 1 ft equals 12 inches). 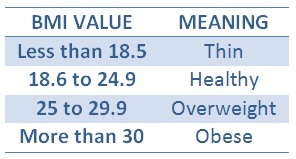 We'll call this H.
BMI = (198/702) x 703 = 28.4, and (see the table above) that means that you are overweight!